Plans to begin fracking in North Yorkshire have stalled due to government work to close a legal loophole, campaigners claim. A decision on the KM8 site in Kirby Misperton had been expected imminently, but a loophole in the Infrastructure Act 2015 had to be dealt with. It allowed wells drilled before 2015 to be fracked without government consent; KM8 was drilled in 2013. The government said it had "no set deadline" for a decision on KM8. A written ministerial statement, issued by Energy Minister Richard Harrington, said hydraulic fracturing consent was introduced in the Infrastructure Act "as an additional step to the existing regulatory and permitting regime". It continued: "However, it does not apply to wells drilled before the 2015 act came to force." 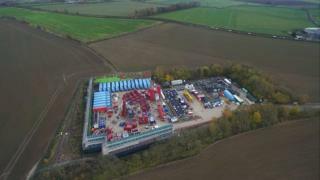 Greg Clark, Secretary of State for Business, Energy and Industrial Strategy (BEIS), has the final say on whether test fracking in Kirby Misperton can take place, with KM8 operators Third Energy now requiring hydraulic fracturing consent. Frack Free Ryedale claim the KM8 site has not even been considered by the government during work to close the loophole, with the operation "now expected to be delayed until the new year". A BEIS spokesperson said the department continued to "go through the application", but would not comment on whether a delay had been caused. Fracking - which involves drilling down and directing water and chemicals under high-pressure into rock to release trapped gas - has not taken place in the UK since 2011. Opponents say it leads to environmental impacts including water contamination, air pollution and earthquakes. Steve Mason, from Frack Free Ryedale, said: "This is just a stay of execution - we will continue to fight the industry which is unwelcome and unwanted in Ryedale." Kevin Hollinrake, Conservative MP for Thirsk and Malton, said: "I think it already has [caused a delay], but not by months, probably by a week or two. "It's important that we get this absolutely right in terms of the legislation and the regulation." Third Energy said: "We have all the required approvals from the regulators for associated hydraulic fracturing and we await the Secretary of State's consent." Anti-fracking campaigners have held daily protests outside the gates of KM8 since September, with the cost of policing the site more than £400,000 up until November. North Yorkshire Police has made more than 70 arrests at the site. Fracking ban: What is the situation in Wales?